Beautiful lake front view of Wisconsin's fourth largest lake through mature trees. This large 2,500 square foot townhome features 10-foot ceilings, music in every room, hardwood kitchen floor, stone counter tops, hickory cabinets, incredibly comfortable high quality beds and linens, plush leather furniture, softened and PH balanced water, a two car attached garage, all in a quiet setting approximately 1/4 mile from the Lake front Bar/Restaurant, VIP Club House, Marina, Arcade, Beach, Swimming Pool & Hot Tub. Located on the Snowmobile & ATV trails. Only 25 minutes from downtown Wisconsin Dells. Spend the day exploring the gorgeous Castle Rock Lake area, experience the night life and local flavor then slip away to a peaceful nights rest. 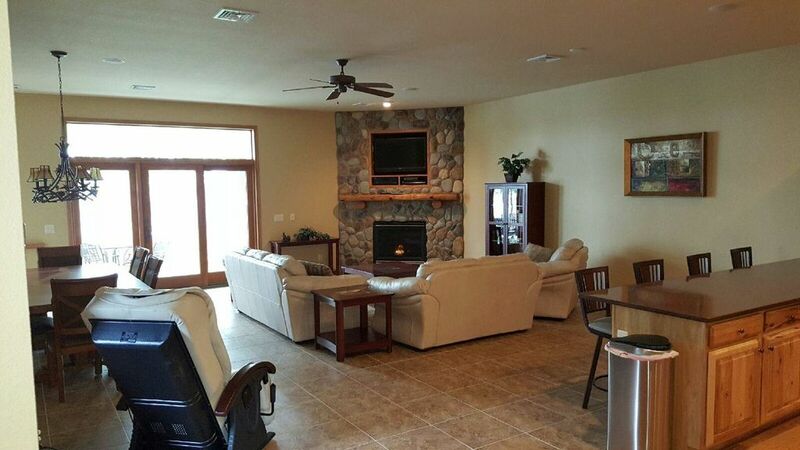 Whether it’s a romantic getaway for two or you happen to have the entire family along, there is always plenty to do at this luxurious townhome on Castle Rock Lake in southwestern Wisconsin. Having worked in residential and commercial construction most of his life, owner Fred Bachmann has a keen eye for property—which made him jump at the chance to purchase the first of only seven townhomes being built along the lake. “I’ve always felt Castle Rock Lake is an undiscovered treasure,” says Bachmann. “My wife Kiya and I live in Madison, a city surrounded by beautiful lakes, but we prefer to travel 75 miles north to Castle Rock Lake. It’s beautiful and serene here, the water is clean, there are endless snowmobile and ATV trails, and it’s an absolute paradise for boating.” Buckhorn State Park is also nestled along its shores, where bald eagles and ospreys circle lazily in the summer sky. Fred’s townhome is one of largest and most upscale homes available for rent on the beachfront, with a breathtaking view of Wisconsin’s fourth-largest lake. Obviously built with the loving touch of a skilled contractor and craftsman, the 2,500-square foot residence is only 25 minutes from Wisconsin Dells and about one hour north of Madison. Outdoor activities abound for all seasons, from swimming and boating and horseback riding to snowmobiling and cross-country skiing. The elegant and comfortable interior, however, makes it tempting to just stay inside. The floor plan is open and spacious, with soaring 10-foot ceilings, large living spaces, hardwood floors, and plush leather furniture. A sound system is located in every room. Make breakfast in an inviting kitchen overlooking the lake, complete with stone countertops, hickory cabinets, and modern appliances. The outdoor pool and hot tub are perfect to enjoy throughout the day. This idyllic setting is a short walk from a top-rated lakefront bar/restaurant, the VIP clubhouse, marina, and arcade. Take a day to explore the natural wonders of the Castle Rock Lake area, sample its wineries, or play a round of golf. Friendly shop owners entertaining nightlife await you nearby. You’ll be surprised how quickly it feels like home! We spent two days at this town home over the winter break with our two teenage daughters. We loved everything about it. The downstairs is spacious and comfortable and we enjoyed dinner at the dining room table, curling up with our dogs by the fire, and the lovely view. We also had a wonderful hike in Castle Rock Park, which is just next door. We have already planned our return for next month! Very nice accomodations, roomy, attractive, beautiful views. Nicely equipped kitchen. Big garage. Thoughtful owners. Beautiful Home on Castle Rock Lake!! Comfortable beds, massage chair was awesome!! We had a wonderful time!! This townhouse was terrific, perfect for our Labor Day weekend away. Spacious lower level, plenty of comfortable furniture. The kitchen was great, very nicely supplied and nice equipment. Room upstairs were spacious and also very comfortable, bathrooms updated. Snowmobile & ATV trail access and only 25 Minutes from downtown Wisconsin Dells.